Valverde is the great champion stallion from the Westphalian licensing 2016. He has an impressive balance in all three gaits, which is well expressed under rider. In 2017 he finished third at the 35-days performance test with a total score of 9,23 in a very strong crop of stallions. In 2018, he won a silver medal at the German Bundeschampionship for 4-year-old stallions in Warendorf under Eva Möller. Together they also won the German performance test for riding horses with 9,5 for canter, 9,0 for trot and a total score of 9,0. The impressive pedigree of Valverde speaks for itself. 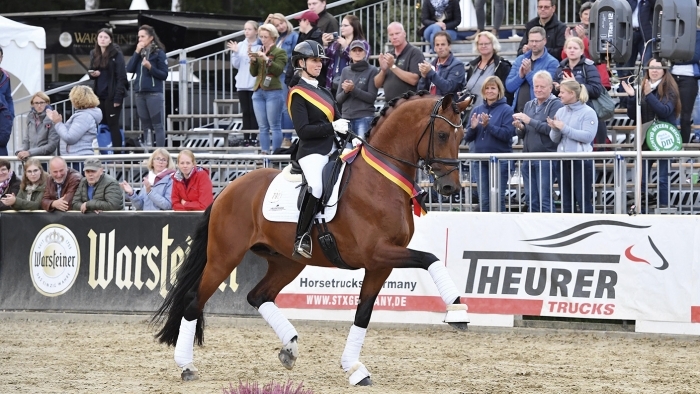 The sire, Vitalis, is reserve champion at the licensing in Nordrhein-Westphalia in Münster-Handorf and later on he competed at the world championship for young horses in Verden both in 2012 and 2013. In 2016, Vitalis was awarded as Stallion of the Year in Ermelo and won the Nürnberger Burgpokal in Frankfurt. Vitalis also sired the amazing mare, Victorias Secret who was world champion for five-year-olds in 2016. The dam of Valverde is awarded with a state premium in Germany. The grand sire, Ampère, is another highlight on the pedigree of Valverde. In 2008, Ampère was the champion stallion at the KWPN licensing in 's-Hertogenbosch and later on he won the 70-days performance test in Ermelo. Ampère has already produced over 50 approved stallions. In third generation you find First Final, who was the reserve champion stallion at the Olderburger licensing in 2005. Valverde is approved in DWB, OLD, HANN, WESTPH, Süddt. Verbände, Mecklenburg, Rheinland. Valverde is stationed at Helgstrand Germany Hengste in Hagen.